I just noticed that OSU Buckeye quilting fabric is finally available. I saw it at JoAnn's, and online - I think at Fabric Shack. No more having to just use scarlet and gray! I, too, am very glad OSU fabric is finally available. I bought several yards when it came out a few months ago. Still looking for the perfect pattern. Please share your pattern ideas! Go Bucks! I bought about 4 yds and was amazed at how good the quality was....images are bright and clear. Was in JoAnn's again recently and they have Ohio State fleece as well which is, also, bright with clear images. As far as a pattern, the men in my family just like "simple" so will make a quilt of 12" OSU blocks alternating with 12" solid white blocks and probably won't use borders but just a binding. 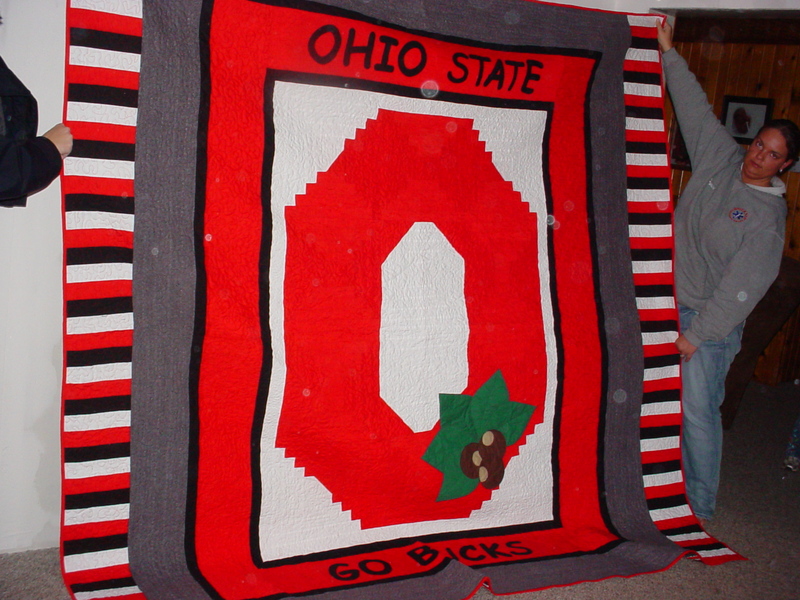 Here is a pic of an OSU quilt I recently made....would have loved to had the OSU fabric for the backing! My daughter-in-law's son by a prior marriage just started at Ohio State. I got some scarlet and gray fabric, and I'm using the Jacob's Ladder pattern from Jenny Doan, plus hand quilting it. The pattern turned out nice, but the hand quilting is taking forever, plus he loves baseball. So, I got a stencil with a bat and ball on it and I want to applique a few on the quilt itself. I hope I finish it before he graduates.